Cadbury's Creme Egg Pavlova Recipe - A delicious, super quick, Easter dessert. You can whip this pudding up in just 5 minutes for real holiday WOW factor! Beat the double cream until just holding soft peaks. Melt both types of chocolate separately over a saucepan of bubbling water. Add the milk chocolate to the cream and fold in. Put half of the chocolate cream mixture to one side. Unwrap and chop up 4 of the Creme Eggs, add to the other half of the chocolate cream. 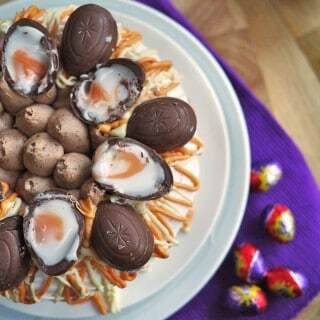 Sandwich the pavlova shells carefully together with chocolate cream mixed with chopped Creme Eggs. Use the remaining chocolate cream to pipe or spoon onto the top of the pavlova tower. Colour half of the white chocolate using a tiny amount of yellow gel food colour. Drizzle or pipe both of the colours of chocolate over the top of the pavlova. Decorate with the remaining Creme Eggs cut in half.